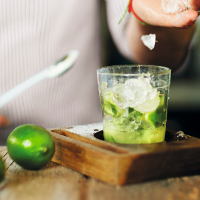 Muddle the lime in the base of a robust tumbler glass to release the juices and oils in its skin. Pour in the cachaça and sugar. add crushed ice, stir well and garnish.